Wednesday July 12th 1922 Was busy at home all morning. Rob took me to Hedges after dinner. I walked home. We were all down to Otts for supper. I took a short ride with him. Read later. 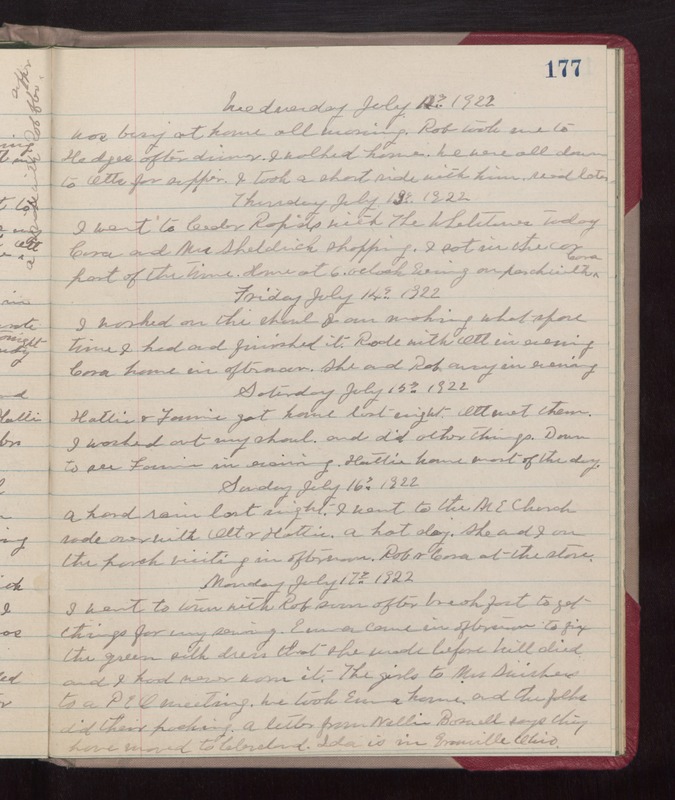 Thursday July 13th 1922 I went to Cedar Rapids with the Whetstones today. Cora and Mrs Sheldrick shopping. I sat in the car part of the time. Home at 6 oclock. Evening on porch with Cora. Friday July 14th 1922 I worked on the shawl I am making what spare time I had and finished it. Rode with Ott in evening. Cora home in afternoon. She and Rob away in evening. Saturday July 15th 1922 Hattie & Fannie got home last night. Ott met them. I washed out my shawl and did other things. Down to see Fannie in evening. Hattie home most of the day. Sunday July 16th 1922 A hard rain last night. I went to the M E Church, rode over with Ott & Hattie. A hot day. She and I on the porch visiting in afternoon. Rob & Cora at the store. Monday July 17th 1922 I went to town with Rob soon after breakfast to get things for my sewing. Emma came in afternoon to fix the green silk dress that she made before Will died and I had never worn it. The girls to Mrs Swishers to a P E O meeting. We took Emma home and the folks did their packing. A letter from Nellie Boswell says they have moved to Cleveland. Ida is in Granville Ohio.